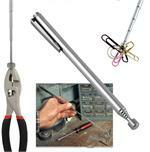 These reachers are offered in lengths of 26 inches or less. 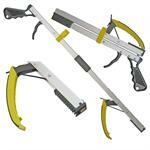 These reachers are good choices for kids and those using wheelchairs or those having weaker wrist strength. Guaranteed Forever Kitchen Reacher. Heat resistant silicone tips- no scuff, no smell. Available in 22, 26, 32, and 42 inch lengths. 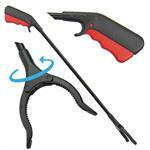 Lightweight, bright orange litter pick up tool with quick action squeeze grip. Free labeling and elastic lanyard included. 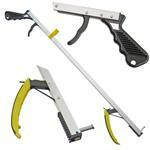 Designed for volunteer clean-up's and available in 23 and 32-inch lengths. 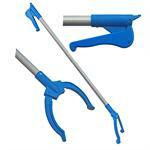 lightweight colorful rubber cup reachers with easy squeeze grip and handy elastic lanyard. All plastic 23 & 32-inch lengths. Original rubber cup grabber for outdoor litter pick up. 20% stronger and available in 20", 32", 40" & 48" lengths. 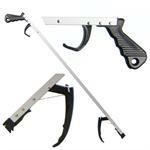 Inexpensive pistol grip home use reacher with positional lock. 20, 26, & 32 inch lengths. 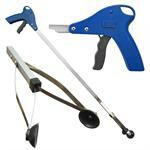 Sleek, lightweight, economical reacher designed for indoor use. 26 and 32 inch lengths.